Droom Technology, which operates online marketplace for automobiles, has raised $30 Mn (approximately Rs 221 crore) in series E round. The round was led by two new investors. Joe Hirao, president and founder of Tokyo based Zigexn Co, has been identified as one of the investors. The name of another investor has not been identified, but it is believed that the other investor also hails from Japan. The Gurgaon based company will use fresh funds for making investment in Droom Credit services, which offers loans to both dealers as well as customers in used cars and bikes segment. Additionally, significant part of the funds will be used for bolstering company’s automobile inspection services. Sandeep Agarwal, founder of Droom. Droom’s latest fundraising round comes closely on the heels of $30 Mn series D funding round, which was led by automobile giant Toyota. The investment marked Toyota’s debut in the Indian startup ecosystem space. At the time of series D funding, company disclosed that it plans to file for an IPO in 2020. 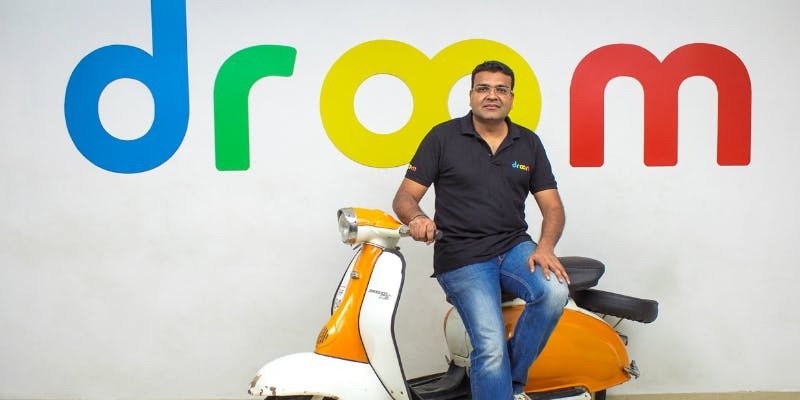 Droom was founded by Sandeep Aggarwal in 2014 with an aim to bring e-commerce revolution in the second hand automobile space. The company had posted revenue of $11 million in financial year 2017-18. In fact, the company boasts pretty good market tractions, making the startup one of the hottest properties in the investment world.